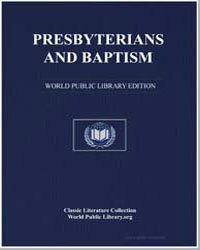 Excerpt: The Reason for Baptism: Christ's Command Christians of many different kinds of tradition are agreed that the basis and authority for baptising in water lies in the command given by Jesus Christ to His disciples and recorded by Matthew (28:18-20) All authority in heaven and on earth has been given to me. Therefore, go and make disciples of all nations, baptising them in the name of the Father and of the Son and of the Holy Spirit, and teaching them to observe everything I have commanded you. And surely I will be with you always, to the end of the age.